I always think it’s funny how there are foods we used to hate as kids but now love as adults. Not that I consider myself an adult. I see myself more as a tall kid. Am I aware that 5ft 2 is not technically tall? Sure I am, but lets not ponder on that. I was a good eater as a child (my childhood photos reveal that) and I’d like to think I wasn’t particularly fussy. Granted I had some weird foodie combinations that I loved but who didn’t? Crisp and coleslaw sandwiches were a must whilst watching cartoons on a Saturday morning. Any crisp would do, though crisps made from maize or corn were preferable. Mango pickle mixed with yoghurt was a regular “snack”, oh and I could eat mountains of black olives and pickled onions at any given time. Perhaps I was an odd child…please don’t judge me. But I digress. Generally, I ate very well and there were just a few things I detested which oddly, I now love! Any sort of seafood was a no go, however Chingri Malai Kari is now one of my absolute favourite dishes. I found bitter melon revolting growing up but now regularly crave it. I couldn’t stand the smell of anything cooked in ghee but now it’s a staple in my everyday cooking. It’s odd isn’t it? 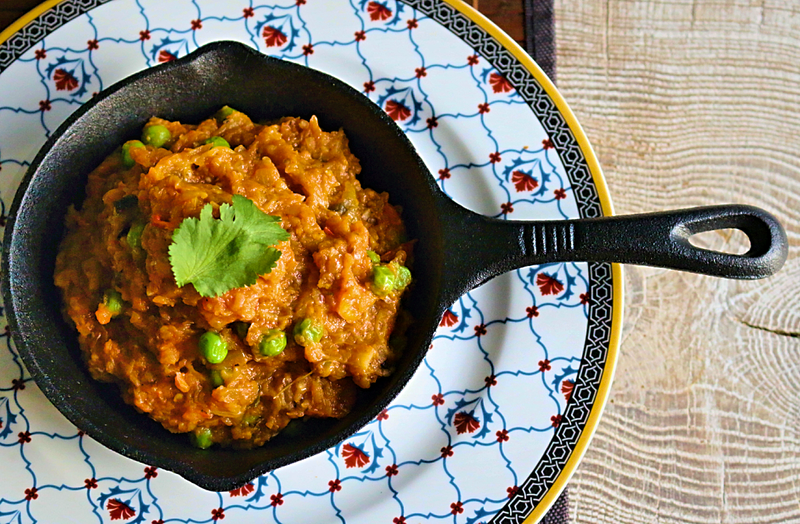 Baigan Bharta also featured on the loathe list but now I can’t fathom how I lived so many years without it! 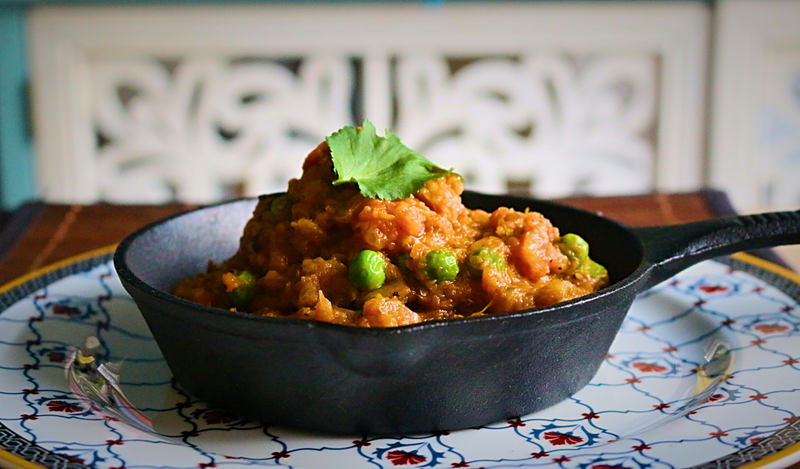 Spicy, smokey (almost BBQ esque) and slightly sweet, baigan bharta is an utterly satisfying dish that’s perfect with hot buttery chapatis. The mashed consistency of the aubergine is akin to baba ganoush so it also works great as a dip, in wraps and smothered on crackers too (I’m thinking canapés at dinner partys people). I hope you like this recipe. It’s surprisingly easy to make and packed full of flavour. Keep me posted on how it turns out for you! Grease the aubergine with oil and roast it over an open flame till it is fully cooked. It should take about 5-7 minutes. When done, the skin should be charred all over and and the aubergine flesh will become soft. If you do not have a gas cooker, you can also cook the aubergine in the grill at the highest temperature until soft. Note, this will however not achieve the smokiness in flavour. Remove from heat and allow to cool. Then peel and discard the skin. Mash the flesh with a fork and keep aside. Heat oil in a non stick pan. Then add the onions and chilli and cook for 3-5 minutes until light golden brown in colour. Add the tomatoes, tomato puree, salt and chilli powder and cook for a further 2-3 minutes. Now add the mashed aubergine and peas and mix well. Reduce the heat and cook for 5-7 minutes. Add the fresh coriander. Check salt and chilli and adjust accordingly. Remove from heat. If you are roasting over a flame, use tongs to hold the aubergine and rotate every few minutes. It may also help to cover the cooker around the ring with foil so it is easy to clean once the aubergine is roasted. So I have been on a bit of a health kick recently. At first it started as a January detox, but I’m pleased to say that I’m not just going “through a phase” and my new found healthy ways have begun to sync with my everyday lifestyle and I feel better for it as a result (hurrah!). I have never ever dieted as my infatuation with food won’t let me. Consequently, I decided to make two simple changes-exercise regularly and eat healthily. Everyone harps on about it and it sounds simple enough right? Well, in a lot of ways it is. In terms of exercising, I essentially needed to consciously make the time go to the gym. With running my own fashion business and hosting regular Spice Club events it became easy to say that I was too busy, but the reality is, we all have the same 24 hours in the day-it’s how we utilise our time that dictates what we get out of it. 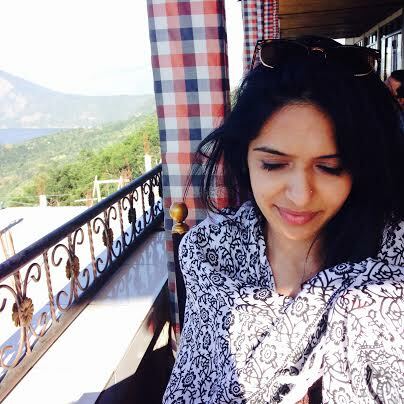 And so my aim now is to get into the gym about 4 times a week and to make sure I don’t get bored (the thought of going to the gym has never made me yelp in excitement) I do a range of different exercises to spice it up-from yoga to swimming, personal training sessions and aerobic classes! Pre-heat oven to 220C (or the highest temperature your oven goes to). In the mean time, place each chicken breast on a lined non stick baking tray. Once the oven is hot, cook for approximately 20 minutes. Turn the chicken pieces over and cook for a remaining 10-12 minutes or until the chicken is white all the way through. 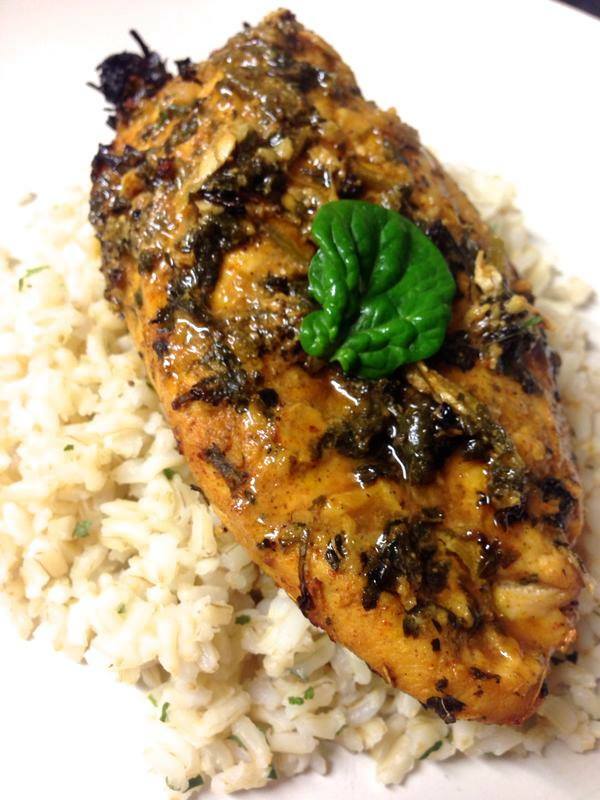 Remove from the oven and serve with brown rice (as pictured) or basmati rice and fresh salad. 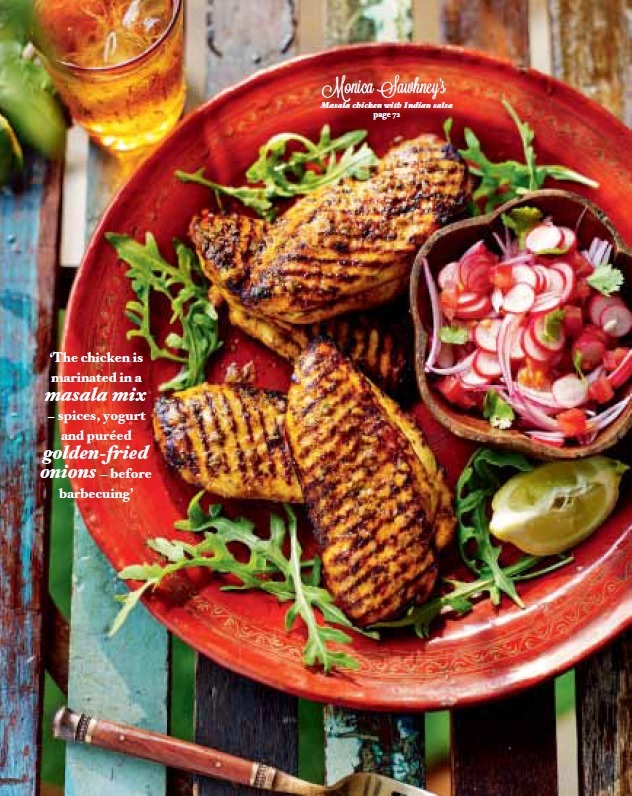 Earlier this year, I was approached by the lovely people at Sainsburys Magazine in regards to a feature on spice inspired recipes for the Summer barbeque season for their July issue. I decided to write a recipe inspired from my Punjabi roots and created a Barbeque Masala Chicken recipe that is packed full of flavour and spice and is great cooked on the barbeque or on the grill. This recipe features a marinade made from yoghurt, fragrant Indian spices and pureed deep fried golden onion to add delicious depth. Sound like your kind of thing? Then, check out the recipe below. I also made a recipe for a simple yet satisfying Indian salsa made from radish and red onions which is refreshing and light and serves as a great accompaniment to the spicy masala chicken. 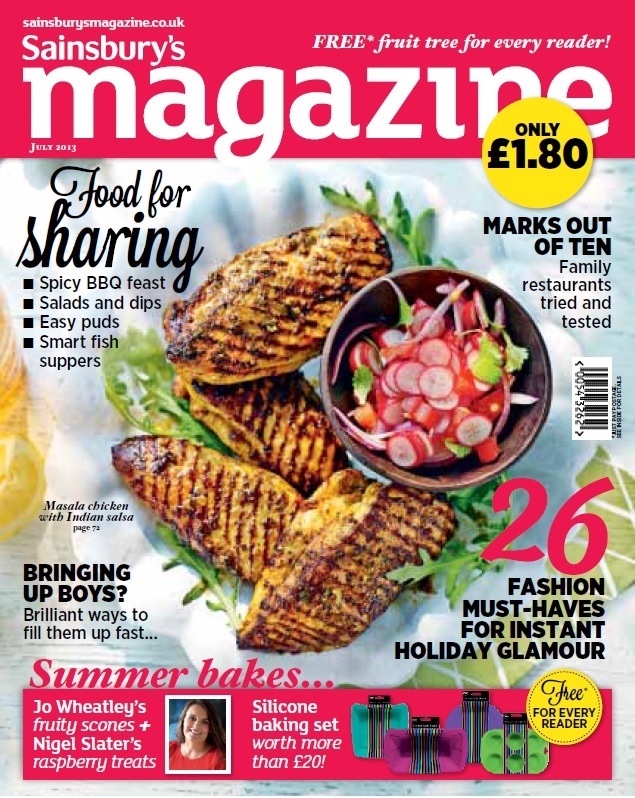 I am delighted to announce that my recipe was featured on the front cover of the magazine which I am thrilled about! The feature also included mouth watering recipes by last years Masterchef winner Shelina Permalloo, Private Chef and Indian food writer, Maunika Gowardhan and Persian food writer and Supper Club host, Sabrina Ghayour so be sure to grab yourself a copy of this month’s issue! The sun is supposed to be making an appearance this weekend so all the more reason to haul out the BBQ and get grilling. Check out my recipe below and facebook or tweet me your thoughts. 1) Pour the oil into a wok so it’s 3-4 cms deep and heat. Deep fry the onions on a medium-high heat for 6/7 minutes or until they turn golden brown. Turn off the heat and leave to cook until fully golden. Remove from oil using a slotted spoon and drain on kitchen paper. Leave to cool. 2) Put the onions, olive oil, lime juice, ginger, garlic, green chilli, tomato puree and coriander into a food processor. Blitz until thick paste forms and transfer to a mixing bowl. 3) Stir in the yoghurt, paprika, turmeric, garam masala and sea salt. 4) Add the chicken breasts and turn in the marinade until well coated. Cover and chill for at least 2 hours. 5) Light the barbeque. For the salsa, put the radishes, tomatoes, onion, black pepper, lime juice and coriander in a bowl. Season with salt to taste and toss together. 6) Barbeque the chicken for 20-25 minutes, turning regularly, until cooked through. Serve with the Indian salsa.